A friend tipped me off about this Cotswold field the previous week and I went to check it out a few days earlier. The orientation seemed perfect for sunset so I returned with a step ladder. Clouds scudding across the sky propelled by a brisk wind offered the possibility of a few moments of direct sunlight. My elevation provided by the ladder avoids the motion blur that would have recorded had the poppies been nearer to my lens and gives the image an abstract feel. 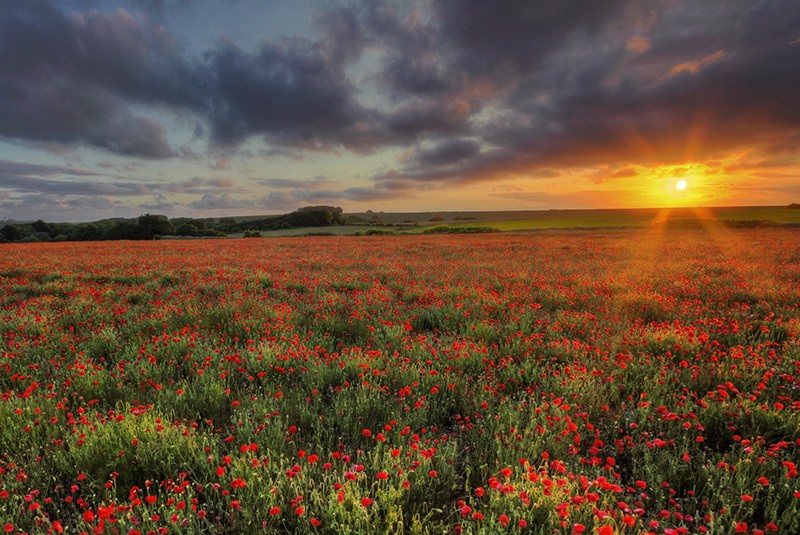 The sea of poppies is well balanced by a dramatic sky. Accepted: Smethwick (2012), Global (Hungary) (2012), Olympic Photo Circuit - Apollo (Greece) (2014), Gia Dinh (Vietnam) (2014).